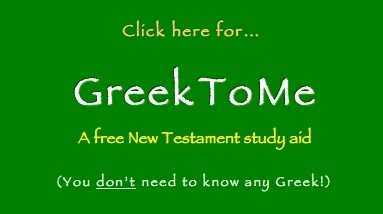 GreekToMe A free Greek New Testament Bible Study program for Mac OS X, Ubuntu, and Windows. GreekToMeLite for Android™ devices An easy-to-use mobile app with a few features of the GreekToMe program. Prayer for Salvation A prayer for you to receive God's gift of salvation. Pride Checklist Attitudes that will limit our effectiveness in the Kingdom of God. Countdown A simple Java timer countdown program for Mac OS X, Ubuntu, and Windows.